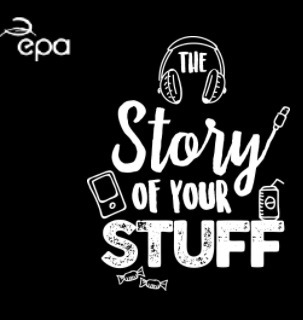 Following the success of last year’s competition, the Environmental Protection Agency (EPA) is pleased to launch the 2018 The Story of Your Stuff. competition for secondary schools. This year the EPA is teaming up with big-wave surfer and marine social scientist Easkey Britton to promote The Story of Your Stuff. The competition invites students to choose an everyday object – perhaps a pen, a mobile phone, a banana, a jumper or a water bottle – and use a visual medium to illustrate its lifecycle. “We want students to unleash their creativity to tell us the story of their stuff. Perhaps a pencil started its story as a tree in another continent or maybe a water bottle was created from oil originating as far away as the Middle East. Students can tell us about where it came from, how they use it, and more importantly, where it’s going to end up! The competition is open to secondary school students up to and including 18 years of age. The prize is: €500 for the winning entry and €500 plus an inspiring talk from Dr Easkey Britton for the school. All information about the competition can be found on www.thestoryofyourstuff.ie . Here students can view a sample video, last year’s winning videos and some tips on how to get started. “Surfing the waves is my passion and the ocean is my second home. I can’t imagine my life without the sea. I feel a responsibility to protect it and it breaks my heart to see how our actions and behaviours damage and pollute our seas, shores and waterways. Every plastic bottle, every coffee cup and plastic bag that enters the ocean causes damage to the life that lives and breathes within the ocean. Ultimately we all lose out by this harm to our environment and equally we can all do our part to protect our environment in some small way and collectively make a difference. The Story of Your Stuff inspires us to think about how we might do that and that’s why I’m thrilled to be part of this great campaign”. The EPA’s web resource provides the best source of information for students to research their entry. Entering the competition couldn’t be easier. Simply fill out the short application form via www.thestoryofyourstuff.ie, upload the entry and click send before the 23rdth March 2018. The competition website also includes a section for teachers with a lesson plan outlining the educational as well as fun elements of this campaign. Students are advised to keep their videos short, ideally 60 seconds and not more than 90 seconds long. Dr Easkey Britton is an internationally renowned professional surfer, artist, scientist and explorer from Donegal. Her parents taught her to surf when she was four years old and her life has revolved around the ocean ever since. She pioneered women’s big-wave surfing in Ireland as the first woman to surf Aileens at the Cliffs of Moher and Mullaghmore, where her performances have earned her international recognition including a prestigious Global WSL Big Wave nomination (the Oscars of big wave surfing!). Easkey is a five-time Irish national surf champion, and holds a Ph.D. in Marine Environment and Society. She works to promote a healthy relationship between people and the sea by using her passion for the ocean to jump-start social change.